As part of this SRHE event on 3rd April 2019, I gave a talk about my paper ‘Understanding The World Today‘ – broadly covering what interpretive dance, ribbon and getting thrown out of a club have to do with navigating a world of fake news. I have to admit that already having written a blog post for SRHE and an article for the Imperial Reporter magazine about my paper recently published in Teaching in Higher Education, I wasn’t quite sure how to approach this talk. I didn’t know whether I should stick closely to the paper, or try to add something new. I didn’t know whether to expect the audience to have read the paper and want something more, or whether they were there so they didn’t have to read the paper in the first place. Finally I decided that I should talk about what I talk about best – how the theoretical ideas link to practice – and what happens in the classroom. Knowledge is not a passive product of learning that can be possessed, but rather it represents an active engagement with ideas, arguments and the world in which they reside. This engagement requires a state of ‘knowing’ – a complex, integrative, reciprocal process that unites the knower with the to-be-known. I then introduced my context at Imperial College, working within the Imperial Horizons programme, and specifically the Change Maker courses using our Live, Love, Learn approach to curriculum design, learning and teaching. For me, all the interest and action is around ‘knowing’. And to facilitate ‘knowing’ there has to be a deep interaction with the ‘knower’. So students are really central to this process. I’m not saying that this is critical in all educational practices and experiences, but I think it is useful for this focus to be present in at least some learning experiences in higher education as I think it might be very useful in generating real criticality, self awareness and an ability to think in deeper ways. With a horrendous mix of metaphors, you might think of traditional lecturing as being a process akin to posting letters in a letter box. The lecturer has the responsibility to package up nuggets of information (letters) and present them to students (post them in the letterbox). It is then up to the students to open up the letter box later in the day (hopefully) and sort through those letters. Make sense of them. Structure and internalise them. An alternative approach would be to put some responsibility on the teacher to help the student locate the ideas internally. To lift the bonnet and see what is going on inside, help the student find a relevant place to stash the new ideas and reflect on how those ideas interact with what else is under the bonnet. Do something active to integrate the new ideas. This is what interests me. And what I think I actively pursue in my curriculum design and learning encounters. To explore this, I presented several examples from my 3rd/4th year undergraduate Change Maker module Lessons From History. This module is structured as team-based learning module. The students work in fixed teams throughout the duration of the module to complete self directed learning tasks. They complete the same set of tasks to explore several different historical disasters. Initially the tasks help the students with ‘discovery’ – finding out the facts of what happened. The students then undertake collaborative team tasks to help them create a ‘knowledge base’ out of this information that demonstrates some understanding of the experience of the disaster (for any number of key individuals). At this point the students also create annotated bibliographies in which they critique a number of sources individually and evaluate the type of evidence that they represent, what they add to understanding of the event and whether or not the student enjoyed engaging with the source. Finally, the students undertake a team writing exercise to apply their understanding. They write their own question, and then answer it in 250 words (tough task) using five sources. They must state why each source is critical to answering the question. The writing must be persuasive and stylish. The teams receive both ‘public’ feedback (feedback that is visible to all students in the class), as well as ‘private’ feedback that is shared only within the team. Each team then evaluates their own performance and writes a feedback response, following our dialogic feedback practice. The students also have the opportunity to submit confidential team reports (one team member must submit a report for each cycle, but every student has the opportunity to submit one if they have something to report/discuss/raise). What does it mean to ‘know’ about something? ‘Although [higher education] can justifiably take pride in its capacity to develop the students’ ability to manipulate the material world […], it has paid relatively little attention to the students’ “inner” development, the sphere of values and beliefs, emotional maturity, moral development, spirituality and self-understanding’. Often my students will say things like – ‘just tell us what we need to know’, or ‘you haven’t actually taught us anything – you should be the expert telling us what we should understand, what is right or what is true’. They see knowing and knowledge as being about the ‘facts’ or ‘information’ that will tell them how the world works. They often don’t feel that their role as the knower is important. In fact, I have great difficulty trying to convince my first year undergraduates that they know anything of relevance, or that they have any relevant skills to exploit or share. And the final year students can be even more entrenched in that view. I therefore think that not only must we prioritise facilitating the ‘knowing’, we must also make this explicit and value the ‘knowing’ and the ‘knower’ in practice. What would it take to make you riot? This kicks off a lively discussion of the moral, ethical and legal aspects of protest, civil unrest and criminality. But it doesn’t get us much closer to understanding what it might ‘feel’ like to be motivated to riot. We then do a drama activity that challenges the students to reflect on their own and others’ emotions. A number of observers are brought to the front of the class. The rest of the students stand, facing the front. I ask them to imagine, and play in their mind like a video, a happy experience. Something that made them feel joyful. As well as the embarrassed giggles and shuffling, we start to see the students relax. They move naturally, with soft, free movements. They smile, their eyes sparkle. And our observers make a note of this body language. I then ask the students to play a mind-video of the moment when they were the most bored they have been in their whole lives. The type of moment when all you can think about is ‘when will this end?’. At this moment, if the room is right, the students are on-board and the gods of doing-drama-with-non-drama-students are looking down on me, there is a sudden shift. The room flattens, the air has been sucked out. The students slump their shoulders and posture. They cast their eyes down, but with a loose gaze. There is shrugging and maybe a little swaying. Next up is anger. An angry moment. The postures stiffen back up. There is still some movement. The students often cast their eyes off in a particular direction with sudden shifts of gaze. Mouths are set, lips tight. The observers keep noting the body language. Finally comes a mind-video of an injustice. Anything, from putting money in a coke machine and not getting a coke, to being accused of something you did not do. The students are initially unsure, and then settle into their memory. Their arms stiffen, often with their arms crossed or braced against the table or chair in front of them. They adopt a fixed gaze, usually downwards or slightly to the side. There is often clenched jaws, or a flexing of the jaw. A downwards but tense sweep of body positioning. We all reflect on the observations so far, what the emotions felt like and what the body language felt like, and the observers rejoin the class. Now working in pairs, the students take it in turns to play their injustice mind-video again, while their partner watches. The feedback this time is not on what was observed, but what it felt like to observe. The students might comment on feeling sorry for the person they were watching, feeling sad or angry for them. Being curious about what was happening for their partner. Some report not being able to stop thinking about a memory of their own while watching their partner go through something unknown. Finally comes the biggest, most risky moment. Asking a student to share their experience with the whole class (we have already discussed being respectful and supportive). As the teacher, you never know what might come out at this moment. Sometimes it is something astonishing, sometimes disappointing, sometimes devastating. And sometimes is has the desired effect and sometimes it doesn’t. One of the best years was when a student shared an experience that she had in a club. She had been having a good time with her friends, impressing someone that she had a crush on. When suddenly, from behind, the student was pushed forwards. She fell into a bouncer and spilled her drink all over him. He shouted at her in front of her friends (and the boy she liked), and started pushing her around. She tried to explain what had happened, but he wouldn’t listen. He then bodily picked her and carried her to the exit. He then threw her into the street. She was humiliated, injured and upset. who was this bouncer? did she get his name? which club was this? this was outrageous! how dare someone do this! what should we do about it? did she call the Police? should the College get involved? should we go there now? what should we do? At this point, the students understand what it means to be united as a group, fired by a common human emotional response to one event that has a deep emotional resonance beyond that single event. They understand what it feels like to be impotent in the face of an injustice, but with a need to act. To do something. To resolve the issue. This is the ideal outcome. A ‘near’ riot in the classroom. But it doesn’t always quite work out this way. However, what I have learned is that there is no single right outcome to this exercise. Often when I feel the exercise didn’t work, students will later report that actually the process had a big impact on them. Just because it isn’t expressed in the moment, in front of the teacher, doesn’t mean that it didn’t have any effect. And this year, there was a funny twist to events. I didn’t think the exercise was going well. The room was too cool and too big, the mind-videos were only producing small body language changes compared to on other occasions. There was scepticism in the room. And there was one student in particular who had previously expressed his disappointment in ‘not yet learning ANYTHING’ in this class. I thought this exercise was rubbish, just a load of b*ll*cks. But I got my partner doing the wrong thing, and my experience was completely different to what all the others are seeing with their partners. I feel different. This is a real thing, I didn’t want to believe it, but it is. I don’t know what to think now. This declaration, made a huge impact on the other students. And without the exercise taking off in quite the way I had hoped, the students then committed and benefitted enormously from the experience. It also paved the way for greater buy-in with future ‘unusual’ activities. Lyotard elevates knowledge from sitting within a single discipline, way of thinking or type of competence, to something that can only exist when these different strands are brought together and united in one confluouspiece of thinking, perhaps suggesting that knowledge represents a higher order of cognitive processing that requires movement and exploration beyond the confines of a single discipline. Lyotard, J.-F. 1984. The Postmodern Condition: A Report on Knowledge. Manchester: Manchester University Press. In the pre-Christmas disaster cycle, the student teams each pick their own disaster to study. The cycle is adapted to reduce the workload and pressure on students as they face many end-of-term deadlines in their core studies. They create their own Knowledge Base and Source List, and then challenge another team to complete a quiz they have written based on a set reading that they select for the other team. Finally the team they have challenged has the opportunity to ask them a question about their own disaster (this all sounds a bit complicated, but it is simple in practice). Usually, the responding team must answer this question spontaneously in an unplanned presentation. If they don’t know the answer, that is fine, but they must find a way to say that and still inform the audience. This year, a preliminary activity took less time than usual, and there was a spare 30 minutes in the session – so I gave the teams 30 minutes to prepare their ‘presentation’. And on a whim, I said that this must be MORE than a presentation, and should be – perhaps – INTERPRETIVE. I’m not sure what I intended – I think I was just hoping for something other than standard presentations. But I was astonished by what happened. The teams disappeared off to discrete corners of the building, and came back dead on time. The first team were answering a question on the Lake Nyos limnic eruption (the emergence of a big bubble of gas from beneath a volcanic lake that suffocated over 2000 villagers living on the shores of the lake). The students performed an interpretive dance of the events, with a scripted narration and a sound track. I was astonished and the class were astonished. The other students were moved to understand something ‘more’ about the events than the date, location and number of deaths. Next up, came the group that had been challenged by the Lake Nyos team. They had studied a series of mudslides in Venezeula. The question they had been set by their partner team was a bit random – ‘was nature trying to subvert Christmas by causing the landslide?’. I wasn’t sure how they might respond to this, but they were inspired by the question, and came in with a 20 minute adaptation of A Christmas Carol, with the ghost of nature, past, present and future and an urbanising capitalist Scrooge. They had a narrator, and they had learned their lines. Although there was a comical moment when Scrooge forgot his next line and consulted the script in his pocket, and it just said ‘… improvise something funny …’. Again, the class were astonished and took away something very different from the play than mere facts and information. After this, we had a mime, a game show, a debate and a Jeremy Kyle reality show-style performance. During the next cycle, I challenged the students to produce their initial Knowledge Base in a new way. 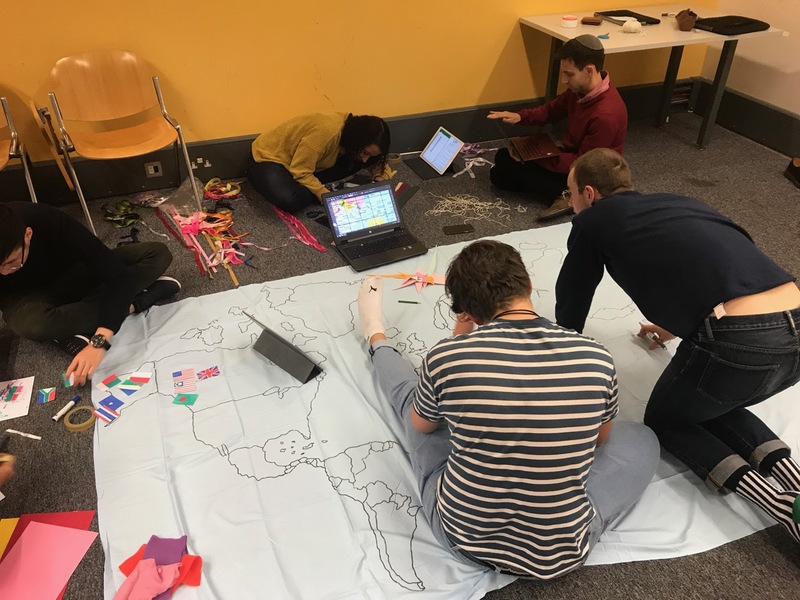 We were studying the 2004 Indian Ocean Tsunami, and I wanted the students to express their understanding of the scale and impact of the event in a physical form. Ideally, a big physical form. As this was a big task, I paired up the teams, so the students also had to get to know new people and collaborate across their well established teams. There would be one week for planning, requesting materials and trying things out. Then following their quiz at the start of the next session, the students would have 90 minutes to create their physical knowledge base. I had indicated that they could use the walls, ceiling, floor – they could move us out of the classroom and work outdoors, in the stairwell or on the mezzanine. I threw my arms around a lot and tried to make the students think BIG. All the mega-teams went with a map-based creation – which made a lot of sense. Some were less inspired and some were amazing. But all the maps included an element that was different to the others – and that was communicated not just as a fact, but as an argument. In physical form. One mega-group had tried to communicate not just the devastation and immediate loss of life caused by the tsunami, but the generational effects of the death and destruction. One group focussed on the ‘scale’ element of the task intently. But rather than going ‘big’, they went miniature. They created a tiny origami-based map that charted the devastation, lives lost, economic impact but also regeneration efforts. Their origami tsunami waves were scaled to represent wave height and ingress. One mega-group really hit the nail on the head in terms of impact. They had decided to make an overhead map. The majority of the group nearly shouted down this idea in the planning stages, but a little judicious intervention and they all got on board with the idea. Their map would be suspended from the ceiling, and all the various types of information would be hanging down from the map. The scale would surround you as you walked underneath. It would brush your face and tangle in your hair. You would be overwhelmed by the great expanse of blue above you. You would feel the power and scale of the tsunami. I was really impressed by the ambition. I fulfilled my part of the task and purchased a large blue sheet. But I didn’t know if the team could pull it off. Whereas the other teams focussed on the Indian Ocean, this team were mapping the entire world. They were going to chart not only where deaths occurred, but the nationalities of the deceased. Not only aid received, but aid given. And it was going to hang upside down from the ceiling. In the making session, the nine students had fierce organisation and intensity. Each student worked solidly for the ninety minutes on their allotted task. There was no chatting, no distractions. They were like a machine. It was absolutely amazing to watch. They were taking the task right to the wire, and we implemented a contingency in case they didn’t complete on time (we had to be out of the room at a specific time, let alone the deadline for the task). The other students, who had completed their Knowledge Bases, presented first. These guys continued to create, create, create. And as the second hand approached the deadline, the team stood and started lifting the map to the ceiling (granted, other team members were frantically sticking on the last elements as it was being lifted). They turned the map and raised it up, billowing and dropping all the data streams of ribbon, card pyramids, strings and flags. And as they explained the map, the other students walked beneath. Felt the data touching them and falling around them. Felt the expanse of blue above them. Felt the impact of the tsunami. Finally, the module was nearing the end. The students negotiate the schedule for the second half of the course – opting for more or less reading or writing exercises – depending on how confident they are feeling. So the cycles are adjusted to accommodate the type of learning they feel they would most benefit from. This year, the students wanted to have the maximum number of complete cycles – they didn’t want more or less of any particular activities (previously students have opted to prioritise writing to have more opportunities for feedback before the final essay). They were enjoying the rhythm and completeness of the cycles. But this would mean there would be a week ‘left over’ before they started their final essays. I gave them the choice of fitting in an extra mini-cycle, or having a ‘Mystery Week’. They asked what a mystery week would entail, and I replied that it would be a MYSTERY. I hadn’t planned for this spare week at this point, so it genuinely was a mystery to me too. The only thing I committed to, was that this week would provide some extra historical disasters that the students could draw on for their final essays (which have to draw from disasters that we have studied in class). I looked back at previous years of the module, and decided that I could provide the students with complete knowledge bases that students had created previously in their team choice cycles. I could anonymise them and put them online. The students would understand the way they had be created, they would know the ‘grammar’ of how they were put together, and would be able to quickly navigate the annotated bibliographies and knowledge bases. But I didn’t want to provide these for ‘free’. They would need to be ‘earned’. And at this point, I thought it might be interesting to reflect on how the students thought they wanted to learn, how they were learning and what this might mean in terms of information and knowledge. Learning could be considered an axis of interaction with the world, where at one end there is a transactional interaction with the creation of an increasing repertoire of discrete items of information, and at the other end there is a more experiential form of learning resulting in a transformational interaction and the development of knowledge. At the start of the course, the students believe that they ‘just want the facts’. They don’t want all this funny nonsense. They don’t want to think and feel. Just learn. So I wondered how far the students had come from this starting point. What would happen if I just provided information. I set up an information sorting task. I gathered discrete facts about three different historical disasters, and wrote them on stickers. I then got the whole class to close their eyes (and they did), while I stickered their foreheads with random facts. They then had 10 minutes to ask each other yes and no questions to determine the nature of their own ‘face fact’. Then the students had a further 10 minutes to find other students who had related ‘face facts’. Once they had organised into three groups, they then had to identify the event their facts related to, and prepare to tell their ‘family history of face facts’ – relating each of the facts to the event. I wasn’t sure how engaged the students would be with the task, but they got stuck in. They found the facts very disorienting, and struggled to make connections between them (they were intentionally on the vague side, although a couple of facts for each event were dead give aways). Each of the three groups had incorrect facts in the group – so when they came to tell the stories they struggled to incorporate them all. And it was the onlookers from other groups who were able to chip in and make sense of things, move facts around and identify the events. The students now had the key facts for each event, but didn’t really ‘know’ about what had happened. We had a quick discussion of the events, and the students were desperate to get into the knowledge bases and find out more. They were able to reflect that having these facts to hand (or on their faces as it turned out), didn’t mean the same thing as what they had come to expect from ‘knowing’. To finish off this session with the students (and my talk), I had been inspired by reading Gina Sherwood’s recent paper in Teaching in Higher Education (go read it, it’s great) about using story telling for learning evaluation. This seemed like a ‘mystery’ type activity, so after our ‘face facts’ exercise, I settled the student teams into writing stories about their experience of the module. I gave them a standard plot framework, and a list of character types. I thought they might reflect on working in their teams, the types of exercises we had done, and the ups and downs of finding their way with the tasks. And some teams did. There was a beautiful poem about coming to love team work from a student who was horrified by the idea of working with others. And stories about negotiations, journeys, time management and reaching the moment of success. But there were also several stories which featured ‘knowledge’ as a character (or weapon). In the first, the students were being oppressed by an evil Chancellor Hauke. They had tried to defeat the Hauke with information, but eventually learned that they needed a greater weapon – knowledge. In two others, knowledge was a princess who needed rescuing, or a character that the students had to find and befriend by overcoming a series of challenges or completing a series of quests. While this activity was light hearted and admittedly the stories were somewhat superficial and tongue in cheek, the narration of the stories did reveal some novel conceptions of knowledge that moved beyond our explicit conversations in class, and related ideas of knowledge to the effort and activity of coming to ‘know’. A podcast of this talk is available on iTunes, or via the SRHE website. And my paper ‘Understanding the World Today’ in the Teaching in Higher Education special edition can be found here.